Hello everyone! Welcome to my tiny house blog. Building a tiny house has been quite an interesting journey that lead to public speaking engagements and cameos in two documentaries. It also allowed me to live in California despite its insanely huge rent prices and inadequate salaries. I took me 3 years to design and save for this house during which time I did massive amounts of research. It took under two months to build the outer shell and another 2 years of evenings and weekends to finish the inside. I have been living in it now for 8.5 years as of January 2019. Reportedly the film played on Al-Jazeera. So some of my 15 minutes of fame will be on Al-Jazeera? Whaaat?! If you want to see the building and planning process check out the posts listed in the column to the right. Most recent posting is on the top. Start at the bottom and watch the house grow. Here is a very early picture of my house along side a more recent one. And now for a big dose of GRATITUDE! I want thank all of you for your love and moral and technical support, your patience, inspiration and belief in me. Thanks to my brother and sister in law for helping me win the money for the very first house purchase- the hardwood floor, at the craps table in Vegas. Thanks to all those lovely people who made me believe I could actually pull this off. I quite literally could not have done this without you. And thanks for not laughing at me or making me feel as crazy as I was already feeling for fixating on this absurdly creative project. That is you Doritt, Abe and Matt and all the lifelong friends who could see I was seriously obsessed and stubborn enough to make it happen. Thanks to you, tiny house builders who came before, who showed me it could be done and even explained how to do it live or on the internet. Thanks to the lovely people of Napa for not running me out of town, for letting me camp in your shopping center and to the campground folks who took pity and let me bathe. Thanks Re-stores (before you got overly proud of your stuff and started charging waaaay too much), thanks to craigslist for helping me find tools, materials and a place to park the finished product. Thanks to all the trees and wildlife of the land that has been my home for just under a decade. I finally got the bucolic bliss I had been longing for since childhood. Thanks to the unseen forces for getting me through those difficult moments when I stood quietly crying in a hardware store because I couldn’t figure out what to get, and for helping me figure out how to do stuff I had no idea how to do. I am grateful for you all! 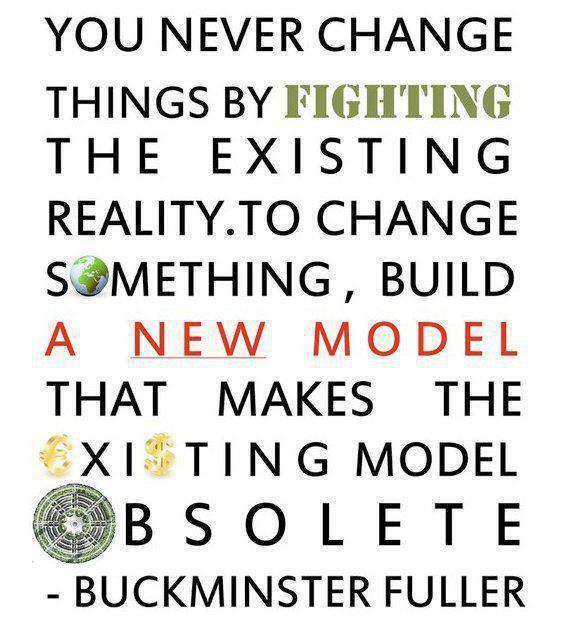 I guess I took old Bucky literally and built me a new model. No more crappy, over priced, moldy, noisy, substandard, apartments, ever again! is that you in the white dress? I didn’t think living there would be so formal. Big Spirit, Big Love makes perfect living space! Enjoy your adventure! I just met you today at The Salvation Army and am so excited to come and see your place. It’s beautiful and I can only imagine the blood, sweat, and tears (AND LOVE) that went into it all. Thanks for being you, Cat….. I am so grateful to have found you on the Tiny House blog through Facebook. Over an hour later and I’m still on your blog. You are inspiring and funny, funny, funny. I am 55 and love that you are building your tiny house at 50. I know some day I will fulfill my dream of one. Right now, I’m letting it percolate in my head and I’m obsessed with all the blogs and photos out there. Videos were where I got my first glimpse…actually NPR did a nice story on them with photos and I got hooked on different makers of tiny house floor plans. Then like you said, it’s gone viral and now you can find yurts and more. I think I will end up being the older hippie I never was when I was younger. Thank you for this great place to hangout. Oh, so sweet. Thank you. It makes my heart glow to know that I have accomplished my goal of inspiring others (especially women) to take this journey of building a home. It really is a lot of work but so very rewarding. Going out to finish my deck now. If you are ever in the neighborhood and want a tiny tour come on by. Life in my gypsy wagon is so peaceful. I wish everyone the happiness I’ve found living like this. Love the curved roof. I am in the planning stages of my own tiny build and have been considering a curved roof. I would love to connect with you around any info or challenges you experienced with that particular kind of roof shape. May the manifesting continue, and it harm none. you should put your sketchup plans up at their new site! This is a really cool design, I’d love to look at it in more detail…. awesome work! I had problems with loading sketch up on my new computer so probably won’t do that. I’m not an architect by any means so not sure how helpful my plans would be to anyone else. I was seriously winging in it then hired a house builder for a week to give me advice on how to actually implement it properly and safely. He taught me how to square up walls etc as well. Cat, I LOVE what you have done, and hope I can do something similar in Ohio! Thank you so much for sharing your beautiful life! You can do it!!!! If I can –anyone can. I wish you the same joy and happiness I’ve found with my tiny home. Thanks Jeannie. Glad you liked the tiny tour and tiny meal. Wait til the deck is covered and there will be even more room for a visit. Bring your pals. Amazing home and great blog! I just started my tiny home and love your design. It is a challenging and super fun journey building a home. I’ve been at it a year now and still not finished. It’s so cool to watch it evolve into being. Good luck with yours. I so wanted to build a tiny house model like I saw on your blog but couldn’t do it. Which of course made me worry that if I couldn’t build a model how the heck was I going to build the house. Then I discovered sketch up which consumed lots of time but saved my hiney. Loved your blog. I got one of those wrist magnets to hold screws. Since i’m a girl it reminded me of the ones we have for sewing to hold pins and needles! Wow you are a true inspiration! I have been in the rent rat race for 21 years, have zero interest in getting in the mortgage rat race, and AM going to build a Tiny House Community in Upstate NY!!! You are great, thank you! Awesome plan. That is the only thing missing where I live- community. Neighbors are nice and making friends who live half an hour away but nothing much in the way of community where I live. That might be the next step. Keep me posted on your process of building etc. Thanks for the positive feedback! Cat! I miss your updates & photos. How are you? Are you staying warm? The winter got the best of me but I stayed warm. Will finish the shower so help me god by the time my Chiron return is exact this month! Will post new photos of all the changes then. Maybe in a week or 2. Hows all with you? I’m very curious about your experience of doing this in the bay area. It seems like, due to population density, the laws here are somewhat strict about allowing you to live in one of these. I’m curious about both your individual experience, and also what you used as a resource for finding out what you COULD do with respect to where to park & live in a tiny house. Craigslist miracle. When I almost had shell finished I put an ad in the area I wanted to live in. I was blessed by the worlds best landlord. He’s great! In fact it allowed me to move back into my home state which I had left because I couldn’t handle the high rent for mold and leaky slum living anymore. 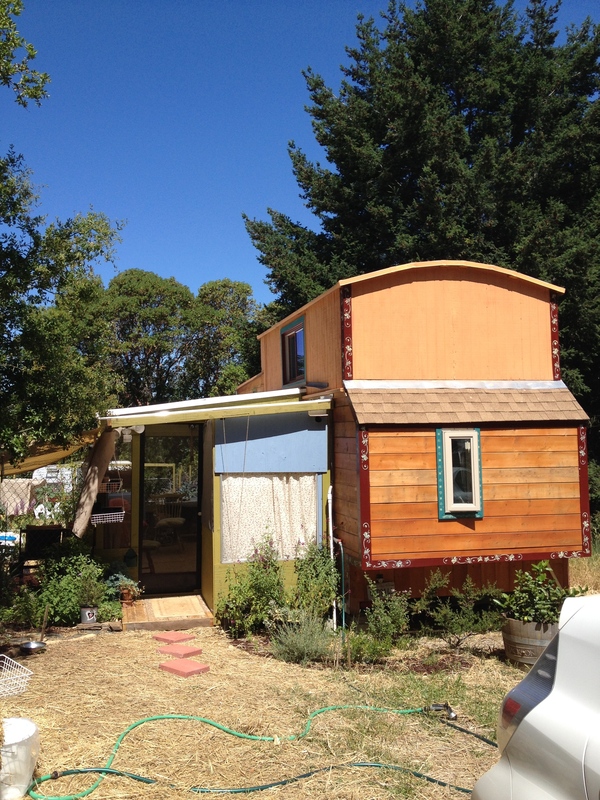 Sonoma allows alternative living like compost toilets and tiny houses. Marin does not. But if you are on a big property well who will know? Also technically you will be a trailer not a house so rules are different. Check what the rules are for living on a property in a trailer. They are usually about 6 months or so. You stay 6 months then go away for a few days and come back for another 6 months. Remember: trailer that looks like a house is still a trailer. I call myself sustainable, classy trailer trash! @mdpatrick – although it isn’t about building a tiny home in the bay area – it is about gardening – you should check out the book “Urban Gardener” – something like that – it’s about a lady who moved to the bay area and started a garden in the lot next to her, with goats and turkeys and all! I’m interested in buying land and building tiny in the Northern California area Wondering if you’ve run into any legal situations due to your home. Are you in Sonoma County and how have they handled your home? We rent a space and so far Sonoma seems very amenable. Nor Cal loves its tiny houses. Everyone I talk to has heard about them or seen one by now. It’s gone viral for sure. When you get a place keep in touch! Love the sweet orbs on the photo of the whole tiny house! What? How did I miss those. Going to look now! Thanks for that! Ok, I looked and didn’t see any. WHich picture are you referring to? I am so happy to see the porch on your beautiful home. I think big-enough-for-sitting-and-reflecting porches are So important for homes. I also love the space for your Cat! Congratulations . Yes I do believe my “southern” pals have rubbed off on me. We sit on the porch and watch the deer walk by now. Quality of life is finally here! That only took 50 years to find. The stars here are awesome too. Could definitely do without racoons however. I understand why nature made them so cute and not very tasty otherwise they would be extinct by now. They have done nothing but dig up my garden despite our efforts to stop them, for 2 months! So yes, deck keeps kitty safe from them too. Kitty loves her new house. I told her for 3 years (while planning) that I was going to build her a house so she could live in the woods. I think she was starting to doubt me. That’ll teach her. Oh feline of little faith. I really enjoyed your journey Would be lovely if you posted more frequently. Personally, I recently joined the Tiny House Movement and am enjoying every bit of it. If fact, my love is so great that i personally built a picture site dedicated to the tiny house movement. You can share all your Tiny house living pics from your building process to plans used, for the benefit of others just joining our movement and to attract readership back to your awesome blog. What do you think? I really would love to know. POST#21 TOUR OF TINY HOUSE FINISHED! POST#12 What the inside of my head looks like…. POST# 6 Cedar siding. Whose idea was that?